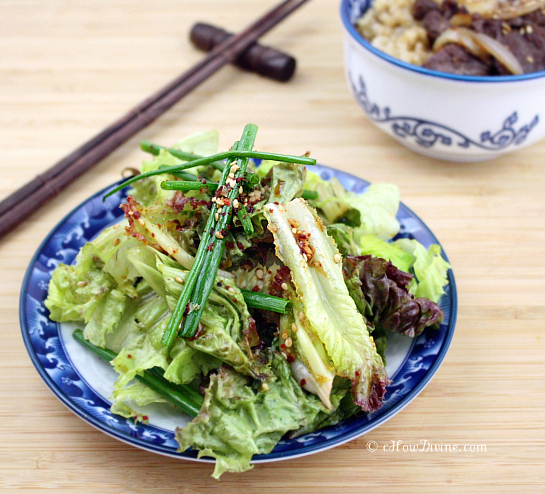 Sangchu Geotjeori (Korean Lettuce Salad) is commonly served with Korean Barbecue at Korean restaurants. Its slightly salty, sweet, and vinegary taste complements Bulgogi and Galbi perfectly. I love it, in part, for the convenience, because I use it in lieu of lettuce wraps – saam – sometimes. It’s almost like eating a bulgogi or galbi lettuce wrap, deconstructed. And you don’t have to get your hands “dirty” in the process. 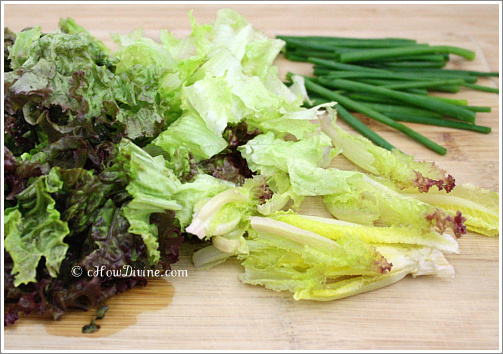 Romaine, green leaf, or red leaf lettuce can be used for this dish. I like to use red leaf because of its vibrant color. But if I have any on hand I mix in a little bit of romaine. It’s a bit tougher than the red leaf. So it doesn’t wilt as easily, especially if you have to leave it sitting for a little while. Although this salad goes so well with Korean barbecue, you don’t have to limit yourself to those occasions. If you are vegan, serve it with “bulgogi” tempeh. Serve the salad as an appetizer. You can even add it to a sandwich. You get the picture. It’s so versatile and so tasty. Maybe you’ve noticed. I pinked up the site in support of breast cancer awareness month. Obviously, cancer reaches far beyond the “pink” or breast cancer. And cancer – not just breast cancer – is an insidious disease that affects not only the person who has the illness, but the entire family. Truthfully, I never gave it much thought until my family was affected by it. I know some believe that breast cancer awareness month has become too corporatized and that it is a profit-churning machine. Regardless, many of the organizations that will benefit from these fundraising efforts provide much needed information to those who are going through cancer, as well as connect those people to others who are/were going through a similar experience. So yes, there are issues. For one, it infuriates me when some of these companies that are involved in the fundraising sell creams and potions that contain known toxins that may have links to cancers and reproductive diseases. But looking at the grander picture, I believe breast cancer awareness month does much more good than bad. I know some of you are experiencing “pink fatigue.” I understand your point of view. But I am doing what I can to support causes that benefit cancer research and organizations that provide support to those who have the disease. Here (Expired) are some ways you can support the cause while doing something good for yourself at the same time. Combine minced garlic and rice vinegar in a small bowl. Let it stand for a few minutes to rid the raw garlic of its bite. Add rest of the ingredients for the dressing: soy sauce, sesame oil, agave nectar (or honey), gochugaru, and sesame seeds. Stir to combine. Set aside. Cut the green onions thinly lengthwise into long shredded pieces. If you are using chives, simply cut them into 2-3 inch pieces. Cut the lettuce into bite-sized pieces or ribbons. Add them together in a large bowl. Pour the dressing from step 1 to the greens. Toss lightly until the dressing is distributed evenly. Garnish with toasted whole sesame seeds and gochugaru (Korean red chili pepper flakes). Serve immediately. *Cook’s Note: As with many Korean dishes, you can vary the seasoning in accordance to your preference. If you like your salads a bit more acidic, add more rice vinegar. If you like them sweeter, add more agave nectar and so on. And use as little or as much dressing as you’re like. Taste as you go. This salad is traditionally made with julienned green onions, but I prefer buchu (chives) to green onions for their milder flavor. So chives were used for this salad. Thank you so much for sharing this recipe!!! I love this salad at my neighbourhood Korean restaurant. I was just searching for the recipe online, but I couldn’t find anything that sounded like it. I was so glad when your post popped up on my google reader. Thanks also for your pink ribbon reminder, a close friend of mine is currently undergoing radiotherapy for breast cancer, and I must visit her soon! Hi Erin! I always ask for seconds (sometimes thirds) of this dish. I just can’t get enough of it paired with good Korean barbecue. I’m happy you like the dish as well. I hope you get a chance to make it at home. I’m sorry to hear about your friend. I’m sure the treatments are making her feel a bit (or a lot) weaker. I hope she gets her strength back soon. I’m sure your support means a lot to her. Salad looks beautiful, vibrant and delicious. Love the flavors that you used to put it together. I def like more acidic! You are so sweet to make your site supportive of the cancer month…looks beautiful, and I wear my pink ribbon pin on my jacket to support! Thank you Sandra! I like my salads more acidic too, definitely with more acid than oil. Cancer awareness is close to my heart. So I thought I should show it, especially this month. Thank you for your kinds words. Wonderful day to you too! Oh yum, this salad dressing sounds amazing. Saving it up. Gosh, I love your food so much! Thank you! You are always so kind. 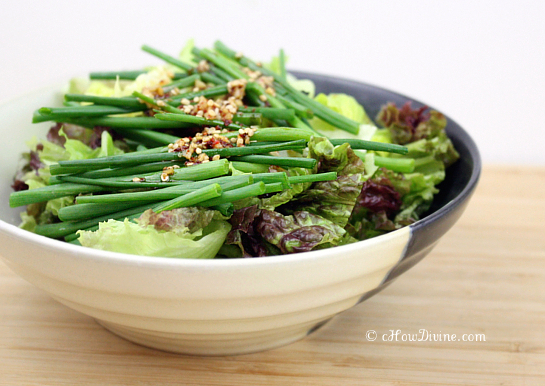 This salad goes really well with bulgogi or galbi. I hope you get a chance to try it! What a tasty salad! It’s so simple, but loaded with flavor! Thanks for sharing this! Have a great weekend! Thank you! I hope you are having a good one as well! I made this with my dinner tonight and, my goodness, it is lovely. My family loved it too! Thank you for letting me know how it turned out Kelsey! I’m so glad you enjoyed it. I am so happy I found your site and look forward to trying more korean recipes. My goal is to learn how to cook more korean food! Thank you for letting us know how it turned out Suree! I’m always happy to find another Korean-food devotee! I’m so glad you enjoyed it. Ponzu sauce sounds great for adding a bit of Japanese flavor. It would go well with beef or chicken teriyaki. Hope you’re having a wonderful week!